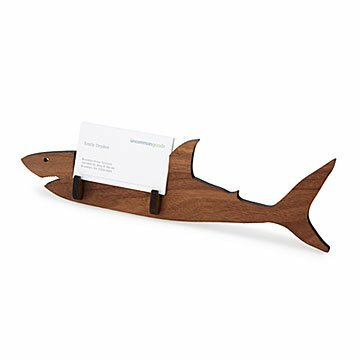 This shark-shaped hardwood business card holder is a desktop design with bite. Whether you're a legal shark in a suit or a card-carrying marine biologist, this business card holder is a desktop design with bite. Laser cut from solid walnut, it's hand-rubbed with a blend of jojoba oil and beeswax for a soft finish. The three-part design can be assembled to face either left or right, and slots together in seconds. Alex finds inspiration in the remarkable natural designs of animals and his shark makes a great gift for graduation, the boss's birthday, or Jaws-loving coworkers. Handmade by Alex Ahrens in Austin, Texas. Take a dip into Alex's day-to-day on the blog and learn more about what being a maker means to him. It may seem like a long way from aerospace engineering to creating animal-inspired designs, but Alex Ahrens finds common ground in precision and attention to detail. His high-tech training gave him an eye for spotting flaws—useful when creating products that people will interact with. Further time spent as a product and packaging designer gave him an appreciation for practical, well-designed objects that are attractive as well as user-friendly. "The uniqueness of animals has always interested me,” Alex observes. "Finding ways to blend functionality with their unique features inspires a lot of my work." Only change I can think of is to have an extra set of vertical supports that would hold a photo or brochure. I have nothing to add and resent being unable to submit without first having to write this sentence. I have 2 more reviews to do. If this is a requirement to submit on them I am done doing your reviews. I don't have time to do this every time! I love my desk shark! Great way to display my business cards on my desk... great conversation starter! Great, novel business card holder.